Yisrael Beiteinu leader says 'voters have had their say,' chose Netanyahu, but has significant demands for joining the coalition. 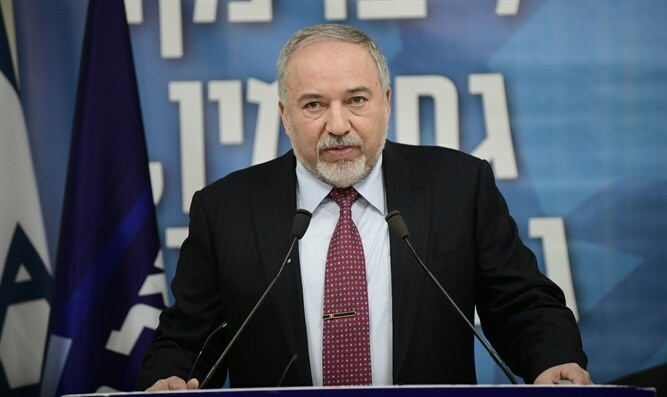 Yisrael Beiteinu leader Avigdor Liberman announced Monday evening that he would recommend Binyamin Netanyahu for prime minister to President Reuven Rivlin. "There was an attempt here in the election campaign to eliminate us from all directions, and we are probably an important part of politics if we managed to upset so many people," Liberman said. He added, "We have a goal of passing a new election law that will deal with manipulations of the polls in the elections, and the pollsters will be required to properly disclose the parties with whom they work." He referred to a meeting he will hold tomorrow with President Reuven Rivlin. "I will recommend Netanyahu for prime minister to the president. The voter has had his word." He added that in his opinion it is unnecessary to invest efforts to form a unity government with the Blue and White Party. "I do not support a unity government, and a unity government is setting up a paralysis government on this particular issue." Liberman also made it clear that there would be significant conditions for his entry into the coalition. "The draft law passed its first reading in July 2018. I did not see that the haredim made a crisis on the first reading, even though they did not support it. We did not invent anything, there are no goats in the negotiations and we will insist on passing the law with exactly the same text." He continued his criticism of the haredim parties and said that "canceling the Western Wall planned is a significant blow to the Diaspora, a backwards move, and it is irresponsible."